Biological nucleic acids have important roles as diagnostic markers for disease. The detection of just one molecular marker, such as a DNA sequence carrying a single nucleotide variant (SNV), can sometimes be indicative of a disease state. However, a reliable diagnosis and treatment decision often requires interpreting a combination of markers via complex algorithms. 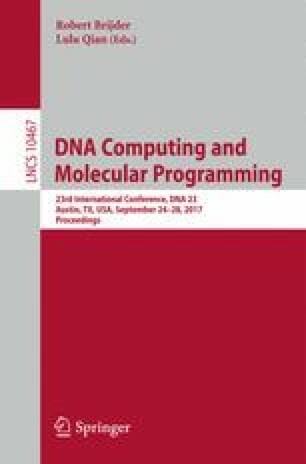 Here, we describe a diagnostic technology based on DNA strand displacement that combines single nucleotide specificity with the ability to interpret the information encoded in panels of single-stranded nucleic acids through a molecular neural network computation. Our system is constructed around a single building block—a catalytic amplifier with a competitive inhibitor or “sink.” In previous work, we demonstrated that such a system can be used to reliably detect SNVs in single stranded nucleic acids. Here, we show that these same building blocks can be reconfigured to create an amplification system with adjustable gain \(\alpha \). That is, the concentration of an output signal produced is exactly \(\alpha \) times larger than the concentration of input added initially, and the value of \(\alpha \) can be adjusted experimentally. Finally, we demonstrate that variable gain amplification and mismatch discrimination elements can be combined into a two-input neural network classifier. Together, our results suggest a novel approach for engineering molecular classifier circuits with predictable behaviors. This work was supported through the NSF grant CCF-1317653 to GS.